Alexis's jealousy of Amanda and Dex is getting the best of her, and she is doing a poor job of hiding her contempt. 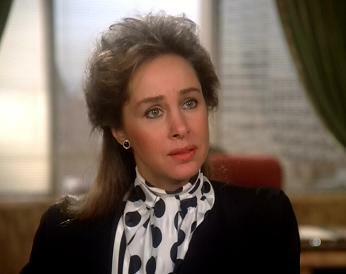 Amanda has no interest in marrying Prince Michael and asks her mother how much it cost her to marry off her daughter. The writing is on the wall for Amanda. Prince Michael broke off his engagement and wants to marry Amanda. Amanda would rather be with Dex, but in a unnecessarily clandestine meeting, Dex tells Amanda (dressed as Carmen San Diego) that he loves Alexis regardless of his feelings for Amanda and that she should marry Prince Michael. Well, what else is Amanda going to do. She agrees to marry the Prince but let's him know that it will only be a fairy tale wedding in name only. There will be no love. Prince Michael is fine with that because he knows that Amanda will come around to love him. Blake, on the other hand, does not believe Amanda loves Prince Michael and will not allow Alexis to ruin Amanda, like she had done with their sons. Adam continues to drive a wedge between Blake and Claudia so that Claudia will turn to him. There really has to be a better way to get your brother's sloppy seconds. Adam, casually as always, mentions to Blake that maybe Claudia and Steven would still be together had Claudia not had an affair with Dean Caldwell. Even though Blake is somewhat accepting of Luke and Steven, he still confronts Claudia about her affair. Claudia pretty gives Blake a dose of reality. Steven is gay, he has chosen to live his life as a gay man, and she has accepted it - Blake needs to do so also and not blame her. As noted, Blake invites Luke over to the mansion for dinner. Blake really is being a good sport about accepting Steven's lifestyle. The dinner is awkward at first. Of course, Krystle takes an instant liking to Luke. Adam is just his prick of a self. 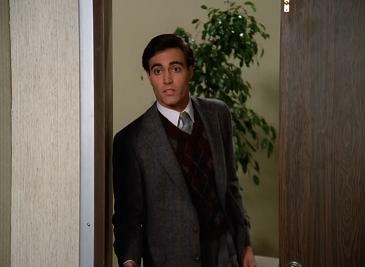 Amanda, rather clueless to the situation, asks Luke about the girls he dated in Yale. There was one, there always is, but it did not work out. It never does. All in all, Luke handles himself pretty well. Basically, if you are Steven's lover and leave the mansion alive, you are pretty much doing well in life. By the way, everyone else knows about Luke and Steven except for Alexis. 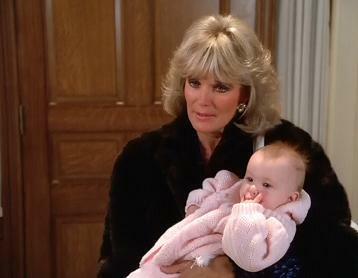 Blake informs Alexis when the two fight over who can manipulate the children. Alexis speaks with Steven and promises him that she will do anything to protect him from Blake. I don't think Steven needs your help this time, Alexis. But, you never know when Blake will relapse into bigotry. Dex is concerned that Daniel Reece will not returning from Paraguay. That is a pretty good bet since Rock Hudson could no longer perform on the show. Anyway, Krystle over hears Dex's concern for Daniel and gets the truth out of him - that they are basically mercenaries. This convinces Krystle that she needs to tell Daniel that Sammy Jo is his daughter. Steven agrees since keeping the secret is tearing him apart inside. Maybe, Krystle would not be so willing to tell Sammy Jo had she known that it was Sammy Jo and Morgan Hess who are responsible for sending pictures to Blake and Krystle to convince them that each is cheating. Let us remember, anytime there is some secret person sabotaging relationships, it is Sammy Jo. Sammy Jo gives up on the picture sending but may have another plan in the works as she seems a woman in a restaurant in New York who looks like her Aunt Krystle. Alexis [to Dex]: It's a big work in your vocabulary, isn't it? Bed. As in to lie or to lay. I never been good at conjugating verbs. Amanda [to Alexis]: What did you trade me for, more oil leases? Tell me, how much does a daughter go for on the open market these days. Why is her head always crooked! 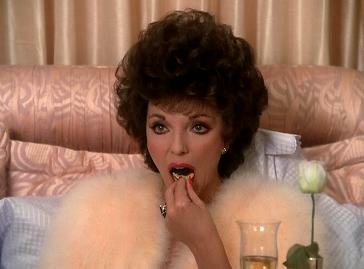 Claudia: Blake, you should know that a wife's infidelity, alleged or otherwise, does not usually turn a husband gay. Blake: Well, usually doesn't apply here, Claudia. Steven is a special case and you knew it when you married him. Claudia: I refuse to accept responsibility for this from you or anyone. What Steven is has nothing to do with me. It has to do with choice. Steven's choice and there is nothing wrong with that choice. Alexis: God, why do you always presume my intentions are to manipulate the children for my ends and not theirs? Blake: You want a memo on that. Krystle [to Blake]: For these past few months, everything I've done has been wrong, wicked and sinful. But not you, no. It's always just harmless and pleasant. Well, I''m tired of it.